The narrative chassis supporting Drive is the sort of heist-gone-wrong story that Hollywood has made and remade a thousand times. As a parable about greed and its unintended, even violent consequences, there’s not a lot of daylight between it and the typical Coen brothers film – a Sophie’s choice offered near the end of Drive closely mirrors the one Anton Chigurh extends to Llewelyn in No Country for Old Men. The pleasure of this vehicle is a matter of style, not substance. Danish filmmaker Nicolas Winding Refn (Valhalla Rising) fills his noir-ish fable with muscle cars and a nihilistic L.A. tableau, playing to the European penchant for stylized cinematic renderings of American culture. In this context, it is little surprise that Refn won the Best Director Award at this year’s Cannes Film Festival. Based on James Sallis’ 2005 novel, the plot revolves around a taciturn Stuntman with No Name (Ryan Gosling) who also exploits his skill behind the wheel at night as a hired getaway driver. Credited as “Driver,” the part-time auto mechanic takes a shine to Irene (Carey Mulligan), a lonely mom living with her son Benicio in an apartment two doors down. When Irene’s husband Standard (Oscar Isaac) is released from prison, he carries home a debt still owed to mob-connected cons back in the big house. This triggers a series of increasingly harrowing events as Driver battles to protect Irene and her moppet from reprisal. Picking out the cinematic influences becomes its own parlor game during Drive’s more meditative moments – the film feels much longer than its 100-minute running time. 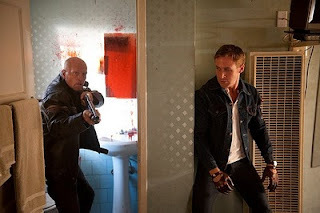 Refn marries the ironic action styling of Luc Besson’s early work with the bloody ultra-violence of Sam Peckinpah, although Driver is less emblematic of David Sumner in Straw Dogs than a steely-eyed, slightly unhinged Steve McQueen. Indeed, Refn credits the McQueen classic Bullitt as an inspiration, along with the works of Alejandro Jodorowsky. Discerning viewers will also spy sidelong references to Williams Friedkin’s To Live and Die in L.A., Walter Hill and the sort of kitschy ‘80s action films that Bernie Ross (Albert Brooks), a film producer turned cold-blooded gangster, says he used to make. The ultimate engine propelling Drive beyond its visual and aural stylings is Gosling’s portrayal. The young actor takes what in lesser hands would be a typical movie tough-guy role and, (blessed) with minimal dialogue, transforms it into a character full of charm, complexities and contradictions reminiscent of De Niro’s Travis Bickle in Taxi Driver. That same surreal, contradictory air extends to Drive as a whole, making it a film that may not appeal to the movie-going masses. However, those willing to go along for the ride will like where they end up.